or email : carol@blackmesaweavers.org to place an order, or for more information. Or call toll-free 1-866-4-CHURRO (866-424-8776) Boston/Eastern (daylight) Standard Time 10 a.m. to 7 p.m.
Migrations deals in new and old American Indian and Inuit (Eskimo) art and crafts, and in other antiques and collectibles from the indigenous arts of the Americas. New work is purchased at fair trade prices directly from the makers or from indigenous cooperatives and enterprises. Items sold-- Images of some items sold. Similar ones may be available. Listening to the Stone -- Poems about sculpture, sea mammals, and baskets. Storytelling -- Stories for the Web. 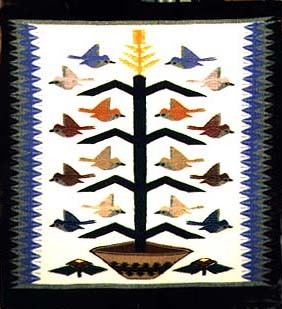 Weaving the Light -- Poems about Dine' (Navajo) and Northwest Coast weaving. Ts'aa'--The Dine' (Navajo) Ceremonial Basket -- Meaning, style, and use. Temperate Rainforest -- Vancouver Island, B.C., Canada. 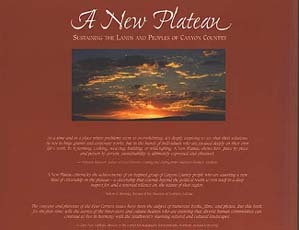 Themes of Transformation and "Places of Power"
Storytelling -- American Indian stories for the Web. 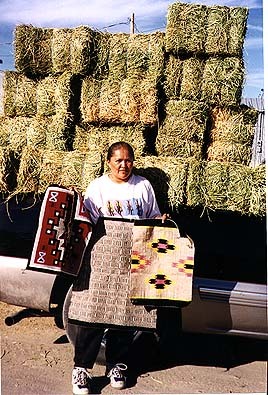 Ts'aa'--The Dine' Navajo Ceremonial Basket -- Meaning, style, and use. or email : carol@migrations.com to place an order, or for more information. Or call toll-free 866-4-CHURRO (866-424-8776) Boston / east coast time 10 am. 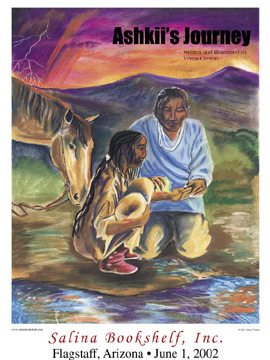 to 7 p.m.
We are honored to announce the publication of a new book, written and illustrated by Verna Clinton, Dine' (Navajo) artist, writer, educator, and a founding member of Black Mesa Weavers for Life and Land, from the Star Mountain community. "Ashkii's Journey" is available through Salina Bookshelf in Flagstaff, AZ, along with other of her fine works. Demonstrations of traditional Dine' (Navajo) arts and culture and wonderful weavings and jewelry for sale from Black Mesa Weavers for Life and Land. "Some people say, 'the poor U'wa. We have to help them,' but the fight is not for the poor U'wa, it is for life," he said. "Millions of monarch butterflies in Mexico are reported to have been killed by pesticides as they began their annual migration to the north. Environmentalists alleged that 22 million of the orange and black butterflies were deliberately sprayed by loggers in an effort to regain the protected forests where the monarchs seek warmer temperatures during the winter months. The butterflies have arrived in the forests of Mexico's central Michoacan state in early November for at least 10,000 years. They leave at the end of March to make the 3,000 mile return trip north to lay their eggs. Homero Aridjis, head of the environmental lobby Group of 100, said, 'Now we don't know how many butterflies will come back this autumn'" (--The Boston Globe, Tuesday, March 20, 2001, on the vernal equinox). against a white stone. . . .
Is carried lightly 'way up high. This poem is preserved in typewritten copy on thin copy paper in the collection of poetry by the poet, which was donated to the State Jewish Museum during its documentation campaign. Pavel Friedman was born on January 7, 1921, in Prague and deported to Terezin on April 26, 1942. He died in Auschwitz on September 29, 1944. I never saw another butterfly. Children's Drawings and Poems from Terezin Concentration Camp, 1942-1944. Edited by Hana Volavkova; revised and expanded by the United States Holocaust Memorial Museum. New York: Schocken Books, Inc., 1993.
by the Hopi Tribal Council police, Friday, August 18, 2001. "Some people say, 'the poor U'wa. We have to help them,' but the fight is not for the poor U'wa, it is for life..."
--There have been no expulsions of nonsigners, and the Department of Justice has indicated that it has no intention of beginning any further eviction proceedings. --The grassroots coalitions of Dine' and Hopi activists (the Hopi-founded Black Mesa Trust), along with the Sierra Club and Natural Resources Defense Council (NRDC) as well as the Navajo Nation and Hopi Tribe, and including Peabody Coal, have all agreed that continued use of the N-Aquifer (the only source of drinking water for the entire region) to move coal from Black Mesa to the Mohave Generating Plant in Laughlin, Nevada, should cease. Alternative ways to move the coal are actively being sought. It is my hope that--in this arid and often drought-stricken region--this will not mean the use of other water resources such as Lake Powell or the Colorado River. Other positive developments include the possible shutdown of the Mohave plant itself by 2005. 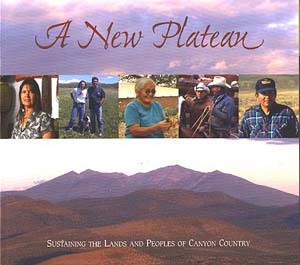 --The 2,000 or more Dine' still living in their ancestral homes on Black Mesa are working toward self-empowerment, renewed community ties, a stronger economy, and the healing of the traumas of relocation. To the Dine' and Hopi both, Black Mesa is sacred. In this 5,400 square-mile region, they had been living side by side for several hundred years and basically at peace until it was discovered in the 1950s that Black Mesa contained the largest low-sulfur coal deposit in the United States. 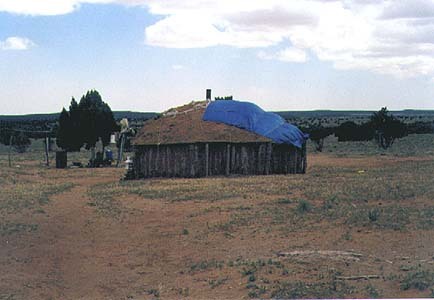 Since then, with the false pretense of a "Navajo-Hopi land dispute," there was unrelenting pressure under the guise of "law" to strip them of their homes, their rights, and their religious freedom. Black Mesa is still being stripmined by Peabody Coal, and the irreplaceable drinking water aquifer under the mesa--the only source of water for both the Hopi and Dine'--is still being drained by a slurry line to transport the coal 274 miles to the Mohave Generating plant in Nevada. The water table is still dropping... and there are recent reports of possibly irreversible damage in the form of sinkholes that may indicate the irreversible collapse of parts of the aquifer. There are also recent good developments and signs of change for the better and your continued support is crucial in keeping this process going. Nine thousand Dine' people endured the Long Walk in 1864, forced from their homes by the U.S. government to imprisonment in an internment camp 300 miles to the east; only about three thousand returned to their homeland in 1868. The Cherokee, Choctaw, and Seminole nations walked a Trail of Tears in 1838 when forcibly removed from their homeland. 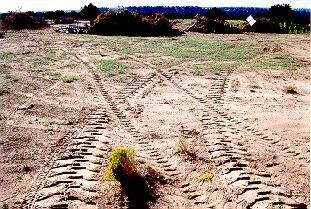 Tens of thousands of indigenous people have died in forced "relocations" and environmental desecration that drove them from their homes. 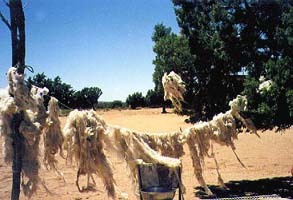 Black Mesa Weavers for Live and Land is working with the Dine' people living on Black Mesa toward continued cooperation with the Navajo Nation and Hopi Tribe to ensure their cultural and economic survival through sustainable development and the healing of fractured communities on both HPL and NPL. There is still time to save the ecosystem and help the people who live in this land to live in peace. We are starting to see the fruits of everyone's labors and there is genuine hope for the future. "Washington seems to be very immature. They believe in lies. They have no pity and cannot see us. We go around wiping our tears because of what they do. Because they do not see us..." (Dine' elder speaking about government policy forcing her from her home, in the documentary film "Broken Rainbow," which won an Academy Award for best documentary feature in 1985; a film by Maria Florio and Victoria Mudd. Dine' home destroyed on Black Mesa. The freeze on home repairs and new construction, in effect since 1974, was lifted only in 1996, with the passing of the Accommodation Agreement. For 25 years (1974-1996), people were not allowed to repair their homes. 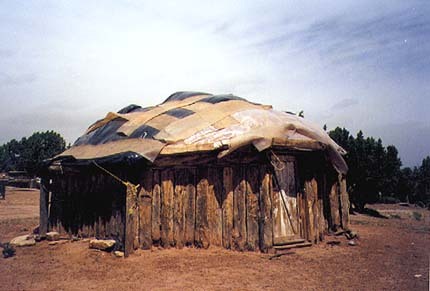 Here are two hogans, which are both daily dwelling places and sacred spaces, with plastic on their roofs, June 1999. Their songs are not heard. The word "Shi'ma" means "Mother" in Dine' bizhaad (Navajo) and "hear" or "listen" in Hebrew. 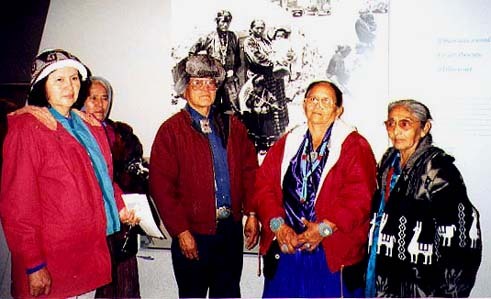 Five of a Dine' delegation to the United Nations in 1998, visiting the National Museum of the American Indian, New York City, November 1998.
or email : carol@blackmesaweavers.org to place an order, or for more information. Or call toll-free 1-866-4-CHURRO (866-424-8776) Boston/Eastern Standard Time 10 a.m. to 7 p.m.
or email to: carol@migrations.com to place an order, or for more information. Or call toll-free 1-866-4-CHURRO (1-866-424-8776) Boston/ east coast DST, 10 am - 8 pm. 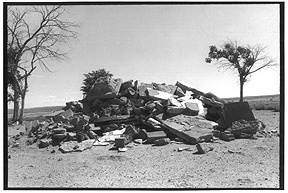 Copyright © 1996 -2012 Carol Snyder Halberstadt, Migrations. All rights reserved. 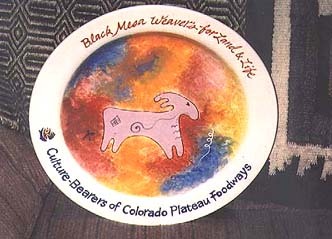 Migrations and Black Mesa Weavers for Life and Land are trademarks of Migrations.